So many strawberry recipes, so little time... until #berrylove ends. If you don't know by now, strawberries are my favorite fruit. I would be remiss, if I didn't add my favorite salad. 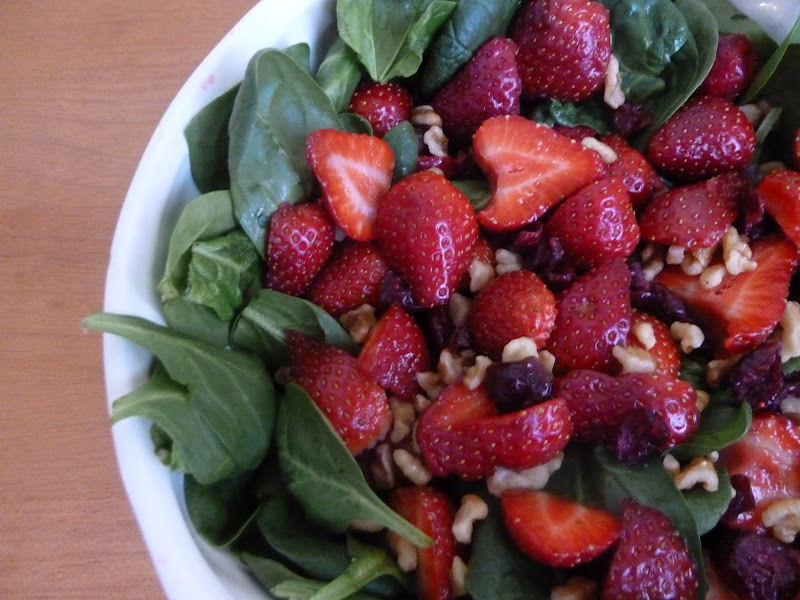 Strawberry Spinach Salad to #berrylove. Everybody has their own take, and I have mine. Whisk vinegar and sugar together, Gradually stream in olive oil , and whisk to combine. Arrange greens in salad bowl. Top with rest of salad ingredients. Chill till serving time. Drizzle with vinaigrette, Toss to serve. 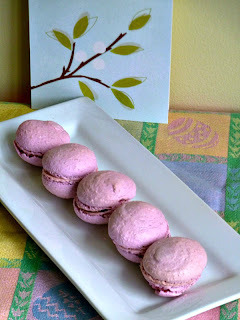 I received these beautiful Macarons from my dear friend Gina, on Saturday. She made these for me to cheer me up and send hugs. For those of you that don't know, my 92 yr. old dad is in Hospice. Good news, Gina, the cookies worked. I had a big smile on my face, as I opened the box, and we could hardly wait to eat, one or three:) Thank you so much, Gina. Hope that you are feeling better. Be on the lookout for a box for you. For some of us, baking and cooking are therapy. Gina's the bomb, isn't she. She keeps asking me for my address but I don't want her to feel obligated to do something for me. I'm a dork. Anyhow, the strawberries. They look absolutely delicious. And it the salad, they're perfect. Gina is a wonderful friend that I have come to know and love. When I get her red box, I make something, and send it back to her. This salad is something that I could eat for every meal for a week without getting tired of it. Strawberries and spinach is an all time fav of mine and you have made it picture perfect. Food bloggers can sometimes make the best friends-the foodie gift exchange is a sweet way to brighten someone's day! This salad is my my fave, and I could eat strawberries morning noon, and night, and I do sometimes. I am so grateful for all of my foodie friends,, like you. So pretty! Strawberry spinach salads are always a staple in my house over the summer, its one of my mom's favorites :) It always makes me think of family get togethers! Looks delicious! Strawberries are in my house all summer long. They have such a vibrant color and flavor. Love them! Strawberry salad is gorgeous, and tastes so good. I love making them. PS...LOVE the salad; it's one of my favorites. Thank you you for your thoughts. I appreciate all of my foodie friends so much. Wow! So good. And how sweet of Gina. I'm sending you a hug from afar. Thank you for sharing. I'm sitting next to my puppy and eating a perfectly ripe peach. Your blog post was a fitting addition to a wonderful afternoon. Becky, I love strawberries a lot, as well! 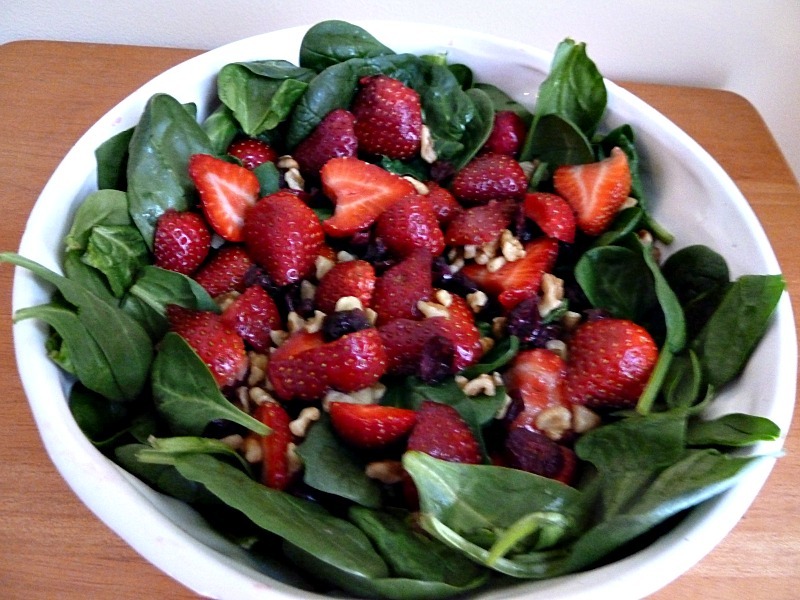 Love your colorful, fresh and delicious spinach salad with the strawberries, and cranberries. Gina is such a sweetheart...so nice and thoughtful of her to send you her amazing macarons! I love strawberries a lot, and the Strawberry Spinach Salad is my fave. Gina is such a dear friend, and I'm lucky to have her as a friend.